Austin.com Austin Animal Center Hosts 'PokéParty': Pokemon and Puppies, Man! Austin Animal Center Hosts ‘PokéParty’: Pokemon and Puppies, Man! Austin Animal Center, 7201 Levander Loop wants you to play Pokémon Go to help get dogs adopted. The city shelter will host the first ever, Pokémon Go themed Party called a ‘PokéParty’ from 11 a.m. to 7 p.m. this Saturday, July 16. Austin Animal Center is a hot spot for players. There is a ‘PokéGym’ on site as well as four ‘PokéStops’. AAC will be putting out ‘Lure Modules’ throughout the day on Saturday to increase the amount of Pokémon, and hopefully increase customers to the Austin Animal Center. The game Pokémon Go allows players to see Pokémon in the background of their camera. 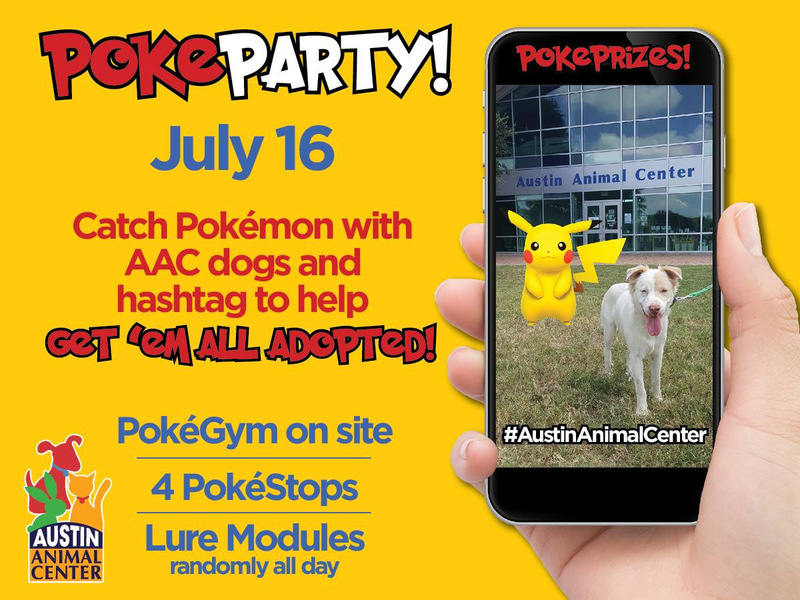 The AAC wants visitors to snap photos of dogs for adoption with the Pokémon characters and share on social media with the hashtag #AustinAnimalCenter in hopes they will get dogs adopted. Volunteers will be walking dogs around the grounds and near the ‘PokéStops’ all day so there will be many opportunities to catch Pokémon with dogs. Volunteers know the dogs they will be walking and are able to tell people more about them. If a ‘Pokémon Go’ player takes a photo of a dog and wants to adopt it, the adoption fee could be waived. Pokémon themed prizes and waived adoption fees will be given throughout the day to anyone participating in the game. The Austin Animal Center, 7201 Levander Loop is open from 11 a.m. to 7 p.m. daily. More information about Austin Animal Center can be found at www.AustinAnimalCenter.org; by calling 3-1-1; or by visiting the Center’s Facebook page at www.facebook.com/AustinAnimalCenter. The City also maintains the Town Lake Animal Center, 1156 W. Cesar Chavez St., as an overflow animal adoption location. It is open daily from 11 a.m. to 5 p.m.